Mentor, OH—Heading into Saturday night’s game between the Mentor Ice Breakers and the Port Huron Prowlers, the Ice Breakers offense was reeling, netting only 10 goals in their last six games and struggling to find the back of the net despite consistently out-shooting the opposition. Mentor may have turned a corner in its 11-7 victory over the Prowlers that snapped the club’s six-game losing skid and set a new franchise record for goals in a single game. Eight different Ice Breakers scored as the series against the Prowlers was knotted up at one game apiece. Mentor wasted no time getting on the board as Mark Essery netted his first goal since mid-December after sending a rebound attempt past Prowlers netminder Cody Karpinski, who was making his Port Huron debut after the club acquired him in a trade with the Watertown Wolves. Nate Farrington and Steven Fowler were credited with assists after Fowler took a pass from Farrington and skated the puck into Port Huron’s zone before firing it on net. The Ice Breakers had a chance to take control of the game early when Edgars Ozolins and Joe Pace Jr. were both hit with minor penalties, but the Prowlers’ penalty kill unit kept Mentor taking advantage. One of the biggest issues plaguing the Ice Breakers throughout the season has been maintaining a high level of play after scoring a goal. The problem arose once again as Port Huron tied the game up 53 seconds after Essery’s goal and took a 2-1 lead just 16 seconds later when Zachary Zulkanycz sent a loose puck into a wide-open net for his 18th goal of the season. At 9:03, Karpinski made a big save before the puck was jostled free. Ice Breakers forward Vaughn Clouston picked up the puck and sent it over the sprawling Prowlers goaltender. Alex Morrow and Brett Oldaker both chipped in with assists on Clouston’s goal, which knotted the game up at 2-2. Patrick Porkka went on to give Mentor its second lead of the night when he deflected home a Thomas McKinnon wrist shot at 14:13. The crazy opening frame continued when Zulkanycz found the back of the net again only 13 seconds after Porkka’s tally. The first-period scoring was capped off when Gordy Bonnel scored on the power play off a big rebound that was created by Brody Duncan’s shot from the point. It was the 12th goal of the campaign for Bonnel, who is tied with Essery for the team lead in scoring. The Ice Breakers held a 21-14 advantage in shots on goal at the end of the opening frame. Things seemed to be settling down as the two teams traded chances early in the second period, but Jonathon Juliano capitalized on a 2-on-1 fast break at 5:54 to tie the game at 4-4. Four minutes later, Prowlers defenseman Edgars Ozolins cross-checked Duncan directly in the face after a whistle. Ozolins was immediately ejected from the game and Duncan got his revenge in the best way possible, scoring just 1:37 into the ensuing five-minute power play. Nate Farrington skated the puck into the Port Huron zone on the right side before sending a pass to Duncan, who was patiently waiting between the circles to finish the one-timer. Later in the period, Fowler broke through for a breakaway before being taken down from behind. The left-handed shooter was awarded a penalty shot and took advantage, deking a few times before finishing over the blocker side of Karpinski to give the Ice Breakers a 6-4 lead. Fowler struck again at 18:18 when he deflected a wrist shot from defenseman Thomas Devesvre to give Mentor its biggest lead of the night. Forward Dalton Jay got the Prowlers back in the game over the final two minutes of the period. The second-leading scorer in the FHL found the back of the net on a rocket of a wrist shot just 12 seconds after Fowler’s penalty-shot goal before cutting Mentor’s lead to 7-6 only 55 seconds later with his 29th goal of the year, completing his second consecutive hat trick. Jay has an eye-popping 6-5-11 scoring line over his last two games against the Ice Breakers. The hectic finish to the second period was completed when Declan Conway beat Karpinski on a wrist shot from the left side on a fast break opportunity to restore Mentor’s two-goal lead with 35 seconds left in the frame. Fowler and McKinnon both assisted on the goal, which made it an 8-6 game heading into the second intermission. 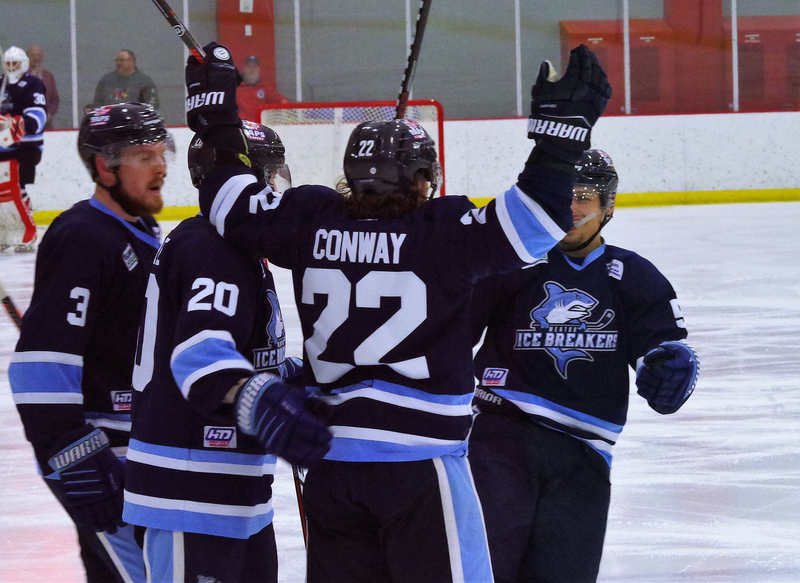 The Ice Breakers skated with a purpose in the final period and were rewarded when Conway struck again at 2:12, going bar down for his seventh goal of the year. Mentor hit double digits when Essery tallied his second goal and team-leading 15th of the season. The Framingham, Massachusetts product took a behind-the-net pass from Bonnel before sending a scorching shot on net that trickled past Cory Simons, who replaced Karpinski between the pipes at the beginning of the final period. With less than five minutes to go, Nate Farrington had his stick slashed in half by Prowlers forward Shea Carey after the play had been blown dead. Clouston stepped in to defend his teammate and landed several hard punches on Kasek, igniting the Mentor faithful before both players headed to their respective locker rooms. Port Huron went on to add another goal at 18:25, but Matt Kadolph put the finishing touches on the Ice Breakers’ amazing offensive performance with a power-play goal with 44 seconds left in the game. Kadolph’s shot came from a tough angle on the right side of the net and appeared to find its way past Simons after hitting a Prowlers defenseman. The game ended in fitting fashion, with an all-out brawl behind Port Huron’s net. Fowler was sprung loose for another breakaway before several Prowlers converged on the crease and a few players were sent sprawling into the net. Chaos ensued as Kadolph took on two Port Huron skaters at once and several minor scraps occurred. Even Simons got in on the action, grappling with Mentor forward Alex Morrow. Although a penalty shot probably could have been awarded, the officials made the decision to end the game with less than a second remaining on the clock. As can be expected in an 11-goal outburst, several Ice Breakers had productive nights. Conway and Fowler added two goals and a pair of assists each while Duncan and Bonnel both chipped in with three-point performances. Essery netted a pair of goals while Farrington and McKinnon dished out two assists apiece. Porkka also had a multi-point outing with a goal and a helper. Between the pipes, recently-signed goaltender Rick Odria made 30 en route to his first FHL victory. The Ice Breakers went 4-for-9 on the man advantage while successfully killing off all three Prowlers power-play chances. For Port Huron, Jay had a six-point night with a hat trick to go along with three assists while Matt Robertson factored in on four goals with assists. Zulkanycz had a 2-2-4 scoring line while Pace Jr. chipped in with a goal and an assist. These two teams will wrap up their three-in-three weekend series tomorrow afternoon from McMorran Place in Port Huron, Michigan.